Koh Racha Yai is the nearer (to Phuket) and larger of the two islands situated less than twenty kilometers south of the tip of Phuket. Diving around Phuket always offers clean and warm water with something interesting to see. Sometimes that's reef fish, rays, invertebrates, or even a shipwreck. 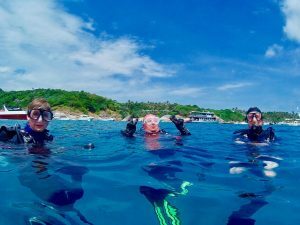 Koh Racha Yai offers all of this and more. Although there is some accommodation on Racha Yai, the majority of its diving visitors come on scuba diving day trips. After boarding the dive boat, expect the trip to take at least an hour an 30 minutes, depending on which of the several great diving sites we are going to visit first. Bring a towel, swimsuit, and something dry to wear afterwards. Sunscreen if you need.